Ken Oringer and Jamie Bissonnette would like to make a public service announcement: Your next backyard party needs wood-fired paella. Here, the eight things you’ll need to make it. Ken Oringer and Jamie Bissonnette would like to make a public service announcement: Your next backyard party needs wood-fired paella. 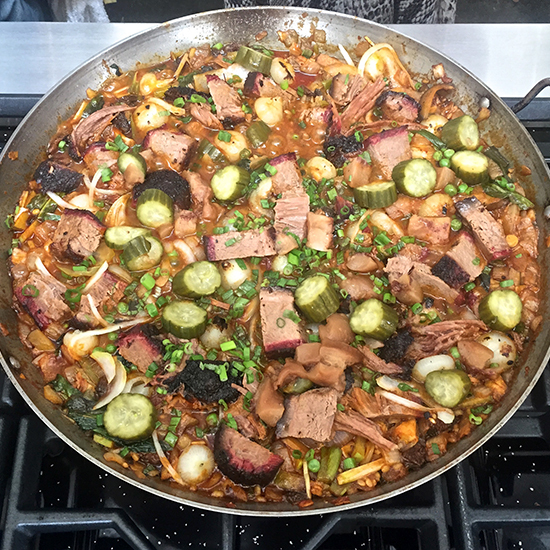 The chef duo is known for making this classic Spanish rice dish with luxe ingredients like lobster, truffles and, at this year’s Austin Food & Wine Festival, smoked bone marrow and thick slices of Franklin Barbecue brisket. But really, you’ll need little more than a sturdy pan and a hot fire to achieve what Oringer calls “instant party.” Here, the eight things you’ll need to make incredible wood-fired paella in your backyard. 1. Basic gear. Oringer recommends investing in a large, heavy paella pan in the heaviest-gauge steel you can find. You can place it on stacked cinder blocks or bricks over a camp-fire (making sure the surface is level), or just put it on the grill. 3. Good olive oil and a solid sofrito. Paella starts with a healthy dose of good-quality extra-virgin olive oil in the hot pan. In that, you’ll cook sofrito, a base made from tomatoes, onion and garlic. It takes time—up to an hour—to achieve a proper dark shade. 4. The right rice. There’s only one type to use: Bomba. This short-grain variety, grown in the Spanish village Calasparra, absorbs 30 percent more broth than other types. 7. Meat and seafood. One excellent combination is chicken, lobster, clams and mussels. 8. Patience. You’ll need it to develop socarrat, the crunchy bottom layer of rice that defines pa-ella. “Paella should never be stirred,” says Oringer. “Every few minutes, we shift the pan to get even cooking.” In the last five to 10 minutes of cooking, Bisonnette likes to place the pan directly on the embers to get a seriously nutty, caramelized crust.